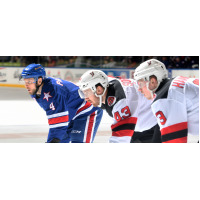 ROCHESTER - The Devils were unable to come back from a three-goal first period deficit against the Rochester Americans, falling 6-1 on the road, Sunday evening. Mirroring the start of last night's game, the Devils carried play early, only to find themselves trailing after the opening 20 minutes. Taylor Leier got Rochester on the board 11:02 into the first period. Leier received a cross-ice pass from Remi Elie on a three-on-two and fired a shot just under Evan Cormier's blocker. The Americans extended their lead to 2-0 with 4:13 remaining in the opening frame. Elie entered the Devils zone on a shorthanded rush and beat Cormier with a wrist shot from the faceoff dot. Rochester tacked on a third goal before the end of the first, as Matt Tennyson wired a wrist shot from just below the blueline. Binghamton entered the intermission facing a 3-0 deficit. Binghamton answered on the power play 2:31 into the second period after Kevin Porter was penalized with a five-minute major for interference on Josh Jacobs. Nikita Popugaev scored his second American Hockey League goal in as many nights, collecting a nifty drop pass from Ryan Schmelzer and beating Scott Wedgewood on the backhand from the slot. Brett Seney earned an assist as well. Rochester pushed their lead back to three late in the third period on a power play of their own. Following a chaotic scramble in the Devils crease, Lawrence Pilut teed up a slap shot from the point and fired the puck past a screened Cormier, making it a 4-1 game at the end of two. C.J. Smith and Rasmus Asplund added goals for the Amerks in the third period, as Rochester downed Binghamton by a score of 6-1.